The field of percutaneous coronary intervention has witnessed many progressions over the last few decades, more recently with the advancement of fully degradable bioabsorbable stents. Bioabsorbable materials, such as metallic alloys and aliphatic polyesters, have the potential to yield stents which provide temporary support to the blood vessel and allow native healing of the tissue to occur. Many chemical and physical reactions are reported to play a part in the degradation of such bioabsorbable materials, including, but not limited to, corrosion mechanisms for metals and the hydrolysis and crystallization of the backbone chains in polymers. In the design and analysis of bioabsorbable stents it is important to consider the effect of each aspect of the degradation on the material’s in vivo performance. 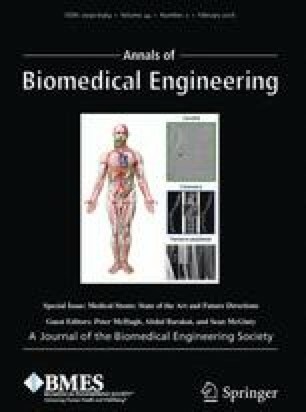 The development of robust computational modelling techniques which fully capture the degradation behaviour of these bioabsorbable materials is a key factor in the design of bioabsorable stents. A critical review of the current computational modelling techniques used in the design and analysis of these next generation devices is presented here, with the main accomplishments and limitations of each technique highlighted. Associate Editor Sean McGinty oversaw the review of this article. Enda L. Boland and Rosa Shine contributed equally to the article. The authors wish to acknowledge funding from the Irish Research Council for Science, Engineering and Technology and a Postgraduate Research Fellowship from the College of Engineering and Informatics, NUI Galway. Biotronik, A. G. Safety and clinical performance of the drug eluting absorbable metal scaffold (DREAMS 2nd Generation) in the treatment of subjects with de Novo lesions in native coronary arteries: BIOSOLVE-II. In: ClinicalTrials.gov. Bethesda, MD: National Library of Medicine (US), 2000. Accessed 2015 May 15. https://clinicaltrials.gov/ct2/show/NCT01960504. Food and Drug Administration. ASTM-FDA Workshop on Absorbable Medical Devices:Lessons Learned from Correlations of Bench Testing and Clinical Performance. 2012. http://www.fda.gov/MedicalDevices/NewsEvents/WorkshopsConferences/ucm312601.htm.